When Henry VIII came to the throne on April 21, 1509, just before his 18th birthday, the English people looked forward to his reign with great enthusiasm and optimism. The new king was vibrant and generous, unlike his father who had been an austere and miserly man. It’s true that Henry VII’s thrift had not made him very popular with his subjects, but it did ensure that he left a spectacular inheritance for his heir. Katherine and Henry seemed to enjoy a happy union, especially by royal marriage standards. It was only after an unfortunate string of stillbirths, miscarriages and only one surviving child – pffft a female! – that Henry’s conscience began to trouble him concerning the validity of the pope’s dispensation. And when the King met Anne Boleyn, well, his conscience began troubling him pretty much 24/7. But that’s a whole other story. The new king was also charismatic, well-educated, generous, chivalrous, and exploited his birthright to the fullest. In the early years of his reign, King Henry sank humungous amounts of money into events such as jousts, sporting events and hunts. He kept many jewelers, musicians and artists very busy – and in the money. Henry prided himself on being a patron of the arts just as much as he valued his athletic prowess. 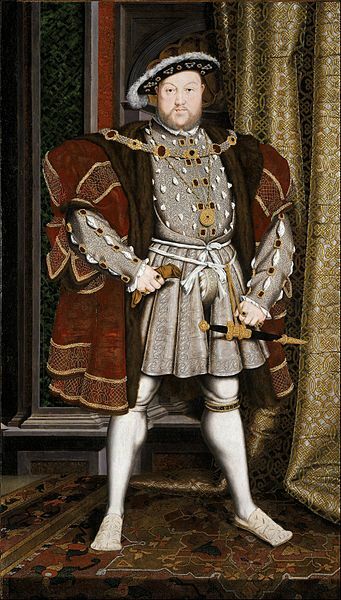 Before Henry VIII became the roly-poly king with anger management issues, he was a true Renaissance man whose accession to the throne was considered a national rebirth by his rejoicing subjects. In later years, much of their love would turn to fear, but on April 21, 1509, the English people were unabashedly proud of their handsome, intelligent and athletic monarch.